State Election Commissioner , Harendra Nath Borah informed today that Lakhimpur district had the maximum number 27 polling stations where re-polling would be held. Voters waiting in queue. Representative picture of Panchayat poll. 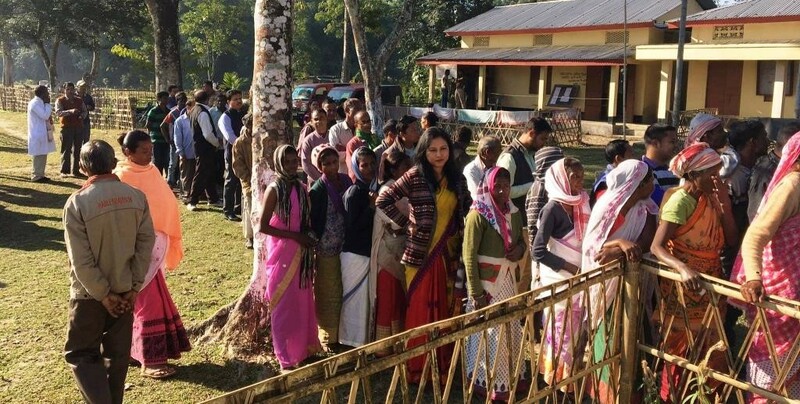 Assam State Election Commission (ASEC)has ordered re-polling in 43 polling stations in the state where first phase of Panchayat Election was held on December 5. State Election Commissioner , Harendra Nath Borah informed today that Lakhimpur district had the maximum number 27 polling stations where re-polling would be held. Among the rest of the polling stations, three are in Kamrup district, four in Dhemaji, two in Dhakuakhana, two in Sivasagar, one in Titabar, one in Charaideo, one in Bishwanath, and two in Gohpur. Re-polling in 27 polling stations in Lakhimpur district will be held on December 10 while it will be held tomorrow (December 7) in rest of the polling stations. The re-polling will start at 7 am. The State Election Commissioner informed that first phase Panchayat Election recorded 74.32 % polling with Darrang district registering the highest polling percentage at 81. 52. Sadiya recorded the lowest turnout at 65.58 %. Poling was recorded at 78.81 % in Majuli LAC represented by Chief Minister Sarbananda Sonowal.